The Movement and Dance sessions are run every Wednesday from 11.30 until 1.30pm in Dance Base, 14-16 Grassmarket, Edinburgh EH1 2JU. The last half hour is social time with fruit and biscuits, tea and coffee. There is no charge for the sessions. in a supportive and joyful environment. The social time at the end of each session is a chance to make connections and feel part of the dance community. 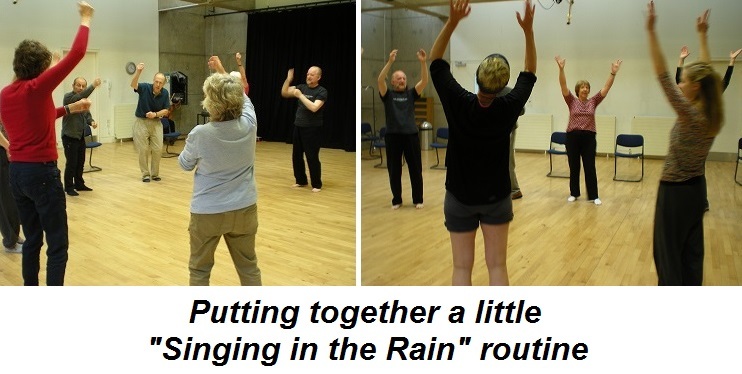 Partners and carers often participate in the dance sessions, finding the classes fun and therapeutic for themselves as well as for people with Parkinson’s. The classes are facilitated by specially-trained dance teachers (Jen Cunningham, Christina Duncan and Sophie Younger) and musician Robert Briggs, with volunteers kindly assisting. The teachers have a wonderful sense of light-heartedness and fun which they bring to the classes. Live music is an essential ingredient, and we have a talented pianist, Robert Briggs, providing the accompaniment, so the music is used flexibly to encourage movement and development of sequences. Each session begins seated to provide a stable base for warm-up exercises then progresses to gentle choreographed movement around the floor. All sequences are adaptable for individual situations of more restricted mobility. To find out about the Dance for Parkinson’s hubs across Scotland download this pdf document DfP info for WEBSITE . For more information please contact Emma Stewart-Jones, Partnership Manager at Dance Base, by sending an email to emmasj@dancebase.co.uk.